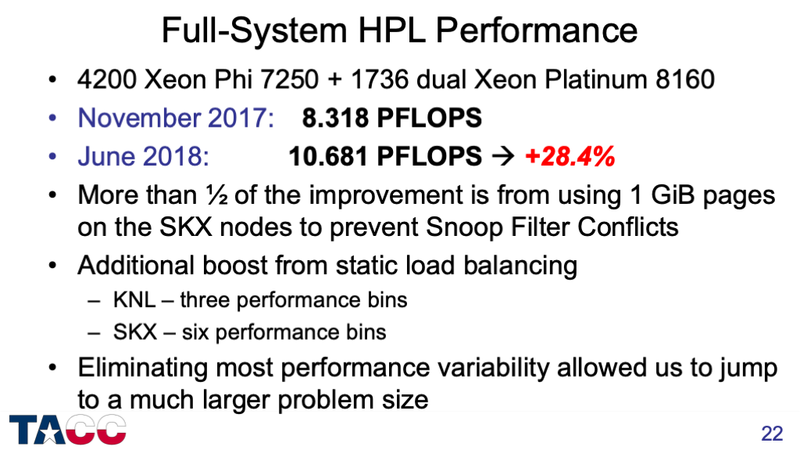 Here are the annotated slides from my SC18 presentation on Snoop Filter Conflicts that cause performance variability in HPL and DGEMM on the Xeon Platinum 8160 processor. 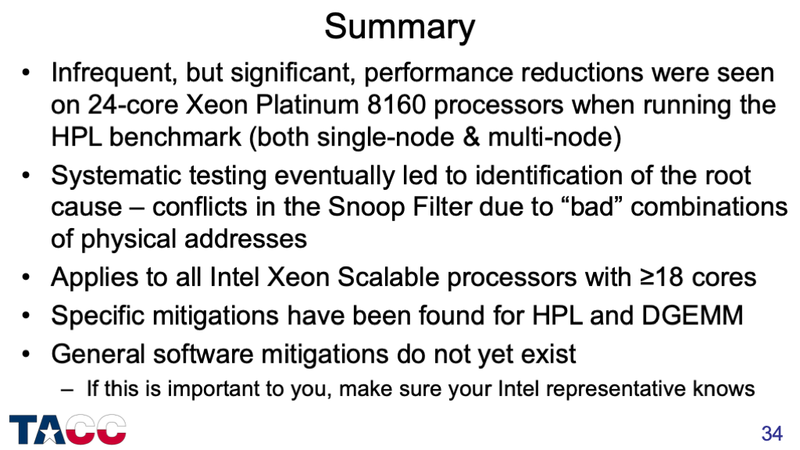 This slide presentation includes data (not included in the paper) showing that Snoop Filter Conflicts occur in all Intel Scalable Processors (a.k.a., “Skylake Xeon”) with 18 cores or more, and also occurs on the Xeon Phi x200 processors (“Knights Landing”). This is less boring than it sounds! A more exciting version of the title. 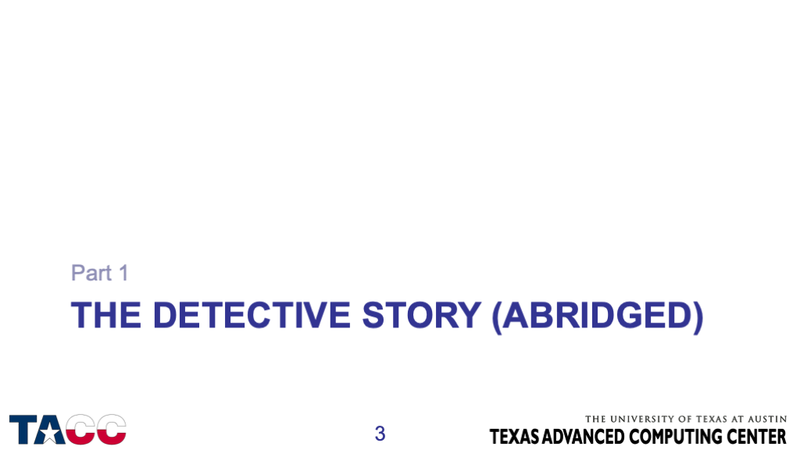 This story is very abridged — please read the paper! Execution times only — no performance counters yet. 500 nodes tested, but only 392 nodes had the 7 runs needed for a good computation of the median performance. Dozens of different nodes showed slowdowns of greater than 5%. I measured memory bandwidth first simply because I had the tools to do this easily. 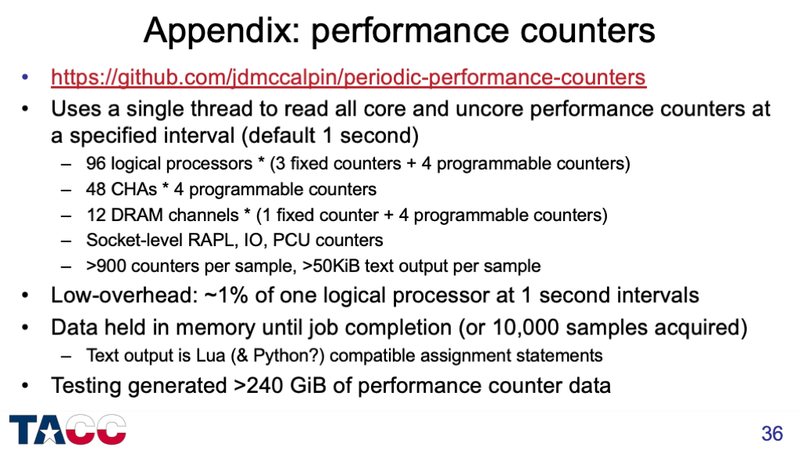 Read memory controller performance counters before and after each execution and compute DRAM traffic. Write traffic was almost constant — only the read traffic showed significant variability. It is important to decouple the sockets for several reasons. (1) Each socket manages its frequency independently to remain within the Running Average Power Limit. (2) Cache coherence is managed differently within and between sockets. 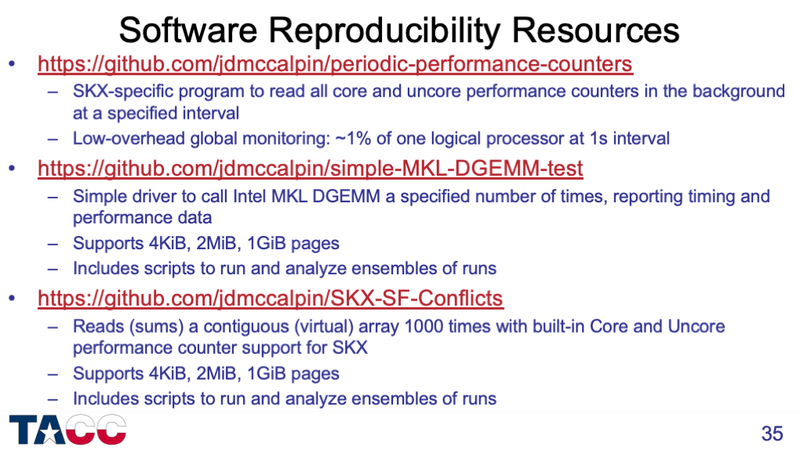 Over 25,000 DGEMM runs in total, generating over 240 GiB of performance counter output. I already saw that slow runs were associated with higher DRAM traffic, but needed to find out which level(s) of the cache were experience extra load misses. 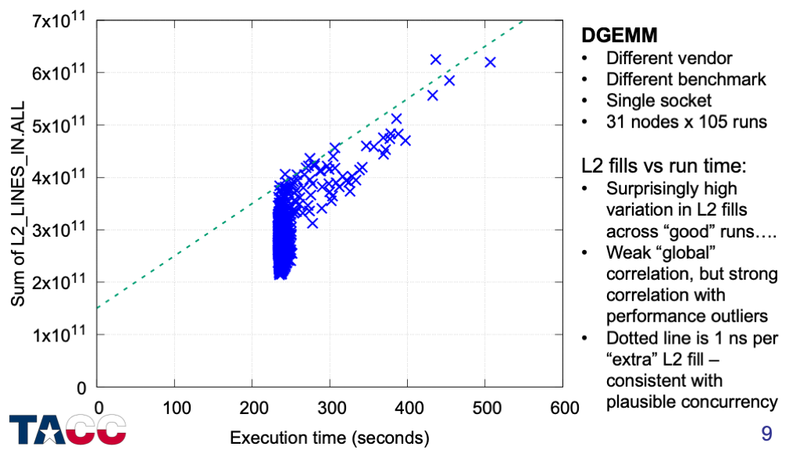 The strongest correlation between execution time and cache miss counts was with L2 misses (measured here as L2 cache fills). The variation of L2 fills for the full-speed runs is surprisingly large, but the slow runs all have L2 fill counts that are at least 1.5x the minimum value. Some runs tolerate increased L2 fill counts up to 2x the minimum value, but all cases with >2x L2 fills are slow. This chart looks at the sum of L2 fills for all the cores on the chip — next I will look at whether these misses are uniform across the cores. I picked 15-20 cases in which a “good” trial (at or above median performance) was followed immediately by a “slow” trial (at least 20% below median performance). 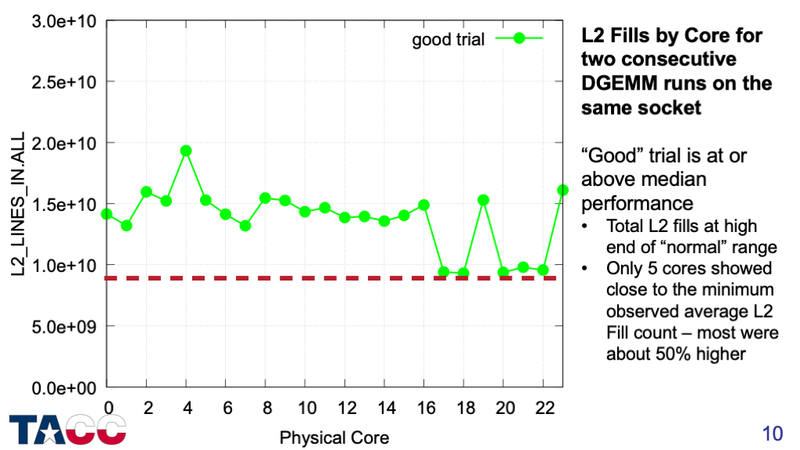 This shows the L2 Fills by core for a “good” trial — the red dashed line corresponds to the minimum L2 fill count from the previous chart divided by 24 to get the minimum per-core value. Different sets of cores and different numbers of cores had high counts in each run — even on the same node. This adds the “slow” execution that immediately followed the “good” execution. For the slow runs, most of cores had highly elevated L2 counts. Again, different sets of cores and different numbers of cores had high counts in each run. This data provides a critical clue: Since L2 caches are private and 2MiB caches fully control the L2 cache index bits, the extra L2 cache misses must be caused by something *external* to the cores. 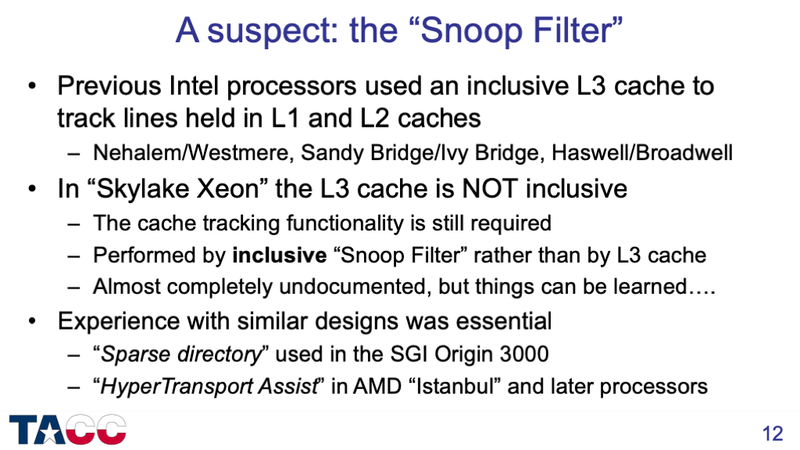 The Snoop Filter is essentially the same as the directory tags of the inclusive L3 cache of previous Intel Xeon processors, but without room to store the data for the cache lines tracked. 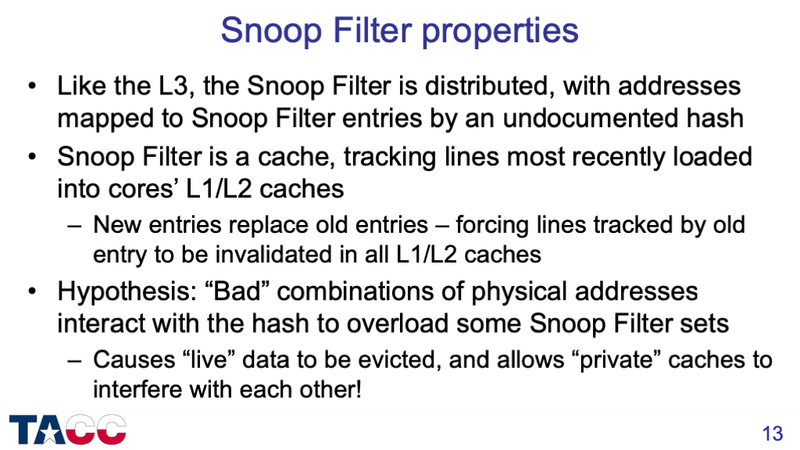 The key concept is “inclusivity” — lines tracked by a Snoop Filter entry must be invalidated before that Snoop Filter entry can be freed to track a different cache line address. 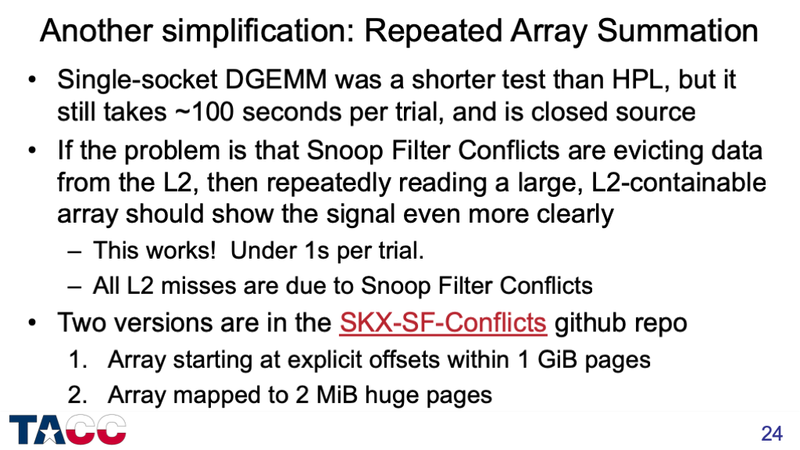 I initially found some poorly documented core counters that looked like they were related to Snoop Filter evictions, then later found counters in the “uncore” that count Snoop Filter evictions directly. 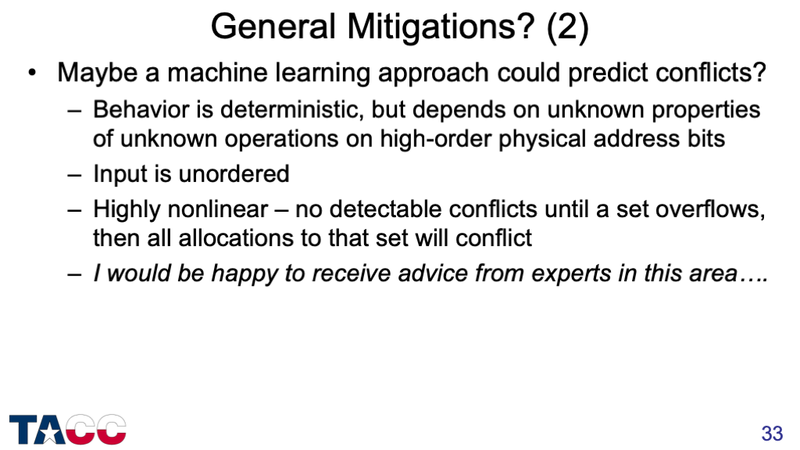 This allowed direct confirmation of my hypothesis, as summarized in the next slides. About 1% of the runs are more than 10% slower than the fastest run. 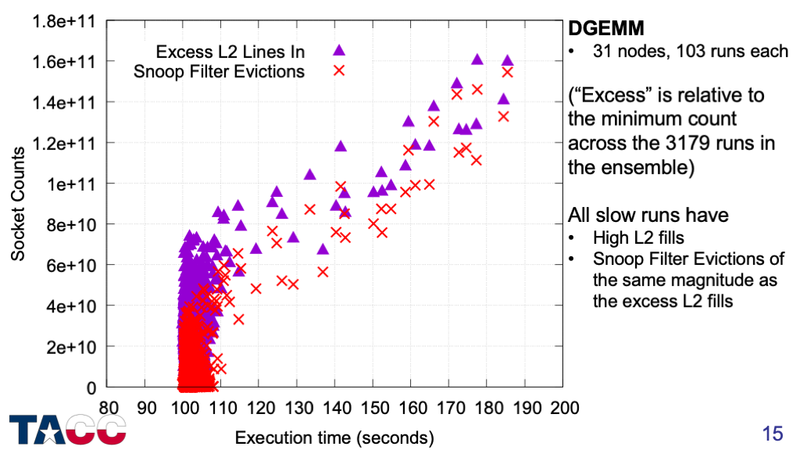 Snoop Filter Evictions clearly account for the majority of the excess L2 fills. But there is one more feature of the “slow” runs…. For all of the “slow” runs, the DRAM traffic is increased. 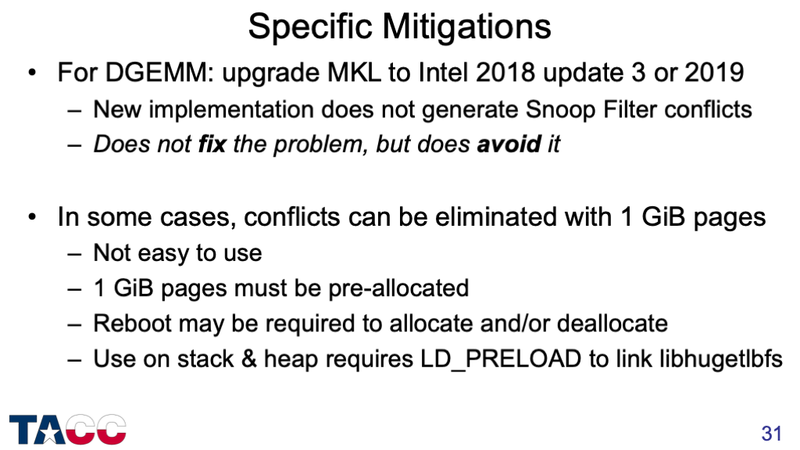 This means that a fraction of the data evicted from the L2 caches by the Snoop Filter evictions was also evicted from the L3 cache, and so must be retrieved from DRAM. At high Snoop Filter conflict rates (>4e10 Snoop Filter evictions), all of the cases have elevated DRAM traffic, with something like 10%-15% of the Snoop Filter evictions missing in the L3 cache. 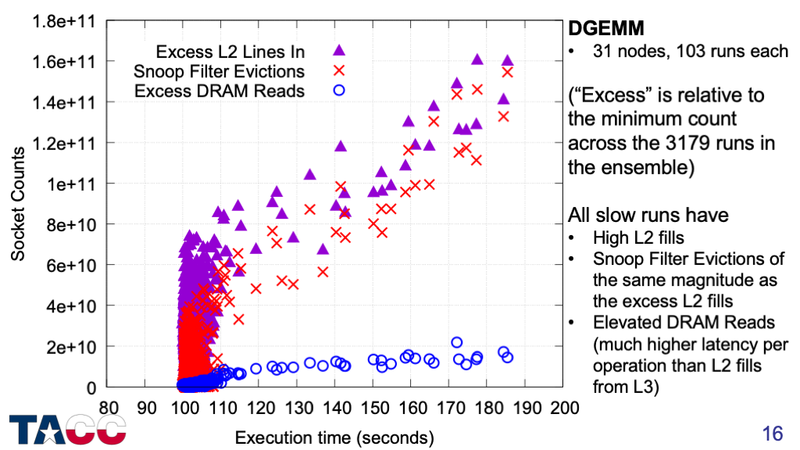 There are some cases in the range of 100-110 seconds that have elevated snoop filter evictions, but not elevated DRAM reads, that show minimal slowdowns. 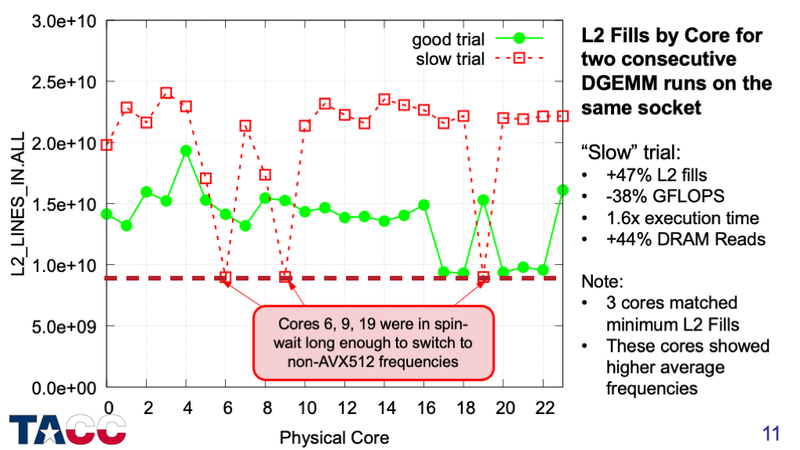 This suggests that DGEMM can tolerate the extra latency of L2 miss/L3 hit for its data, but not the extra latency of L2 miss/L3 miss/DRAM hit. Based on my experience in processor design groups at SGI, IBM, and AMD, I wondered if using contiguous physical addresses might avoid these snoop filter conflicts…. With 1GiB pages, the tail almost completely disappears in both width and depth. 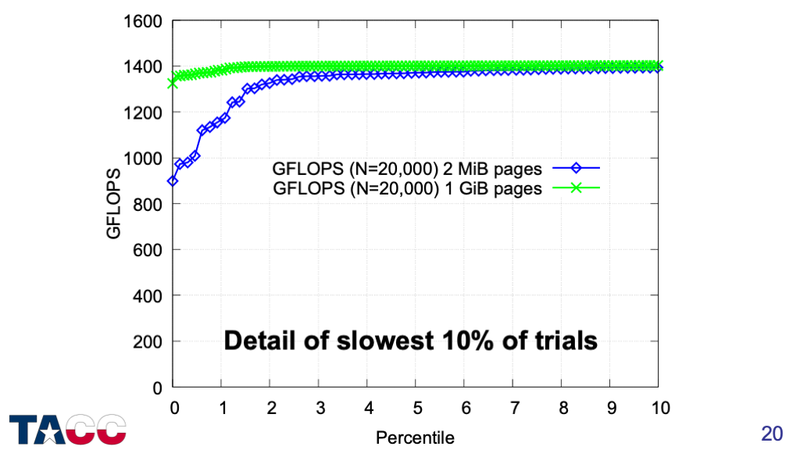 Zooming in on the slowest 10% of the runs shows no evidence of systematic slowdowns when using 1GiB pages. 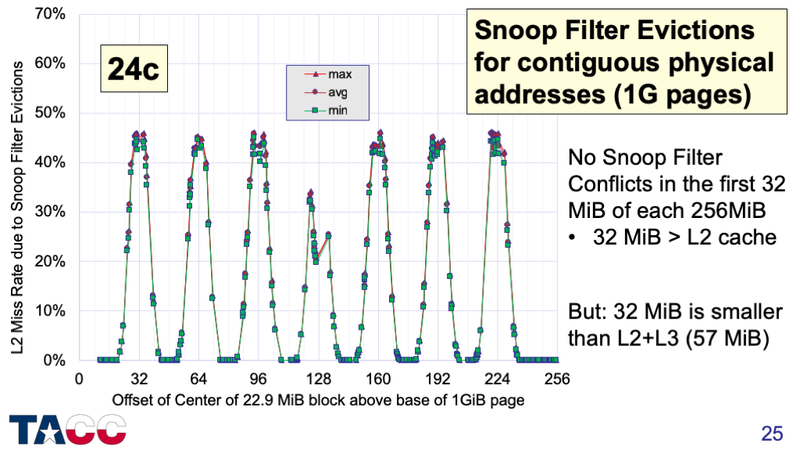 The performance counter data confirms that the snoop filter eviction rate is very small. So we have a fix for single-socket DGEMM, what about HPL? 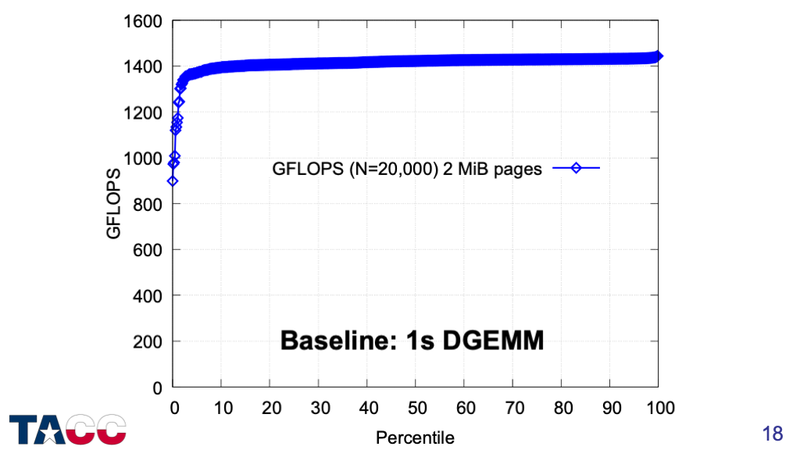 Intel provided a test version of their optimized HPL benchmark in December 2017 that supported 1GiB pages. First, I verified that the performance variability for single-node (2-socket) HPL runs was eliminated by using 1GiB pages. The variation across nodes is strong (due to different thermal characteristics), but the variation across runs on each node is extremely small. 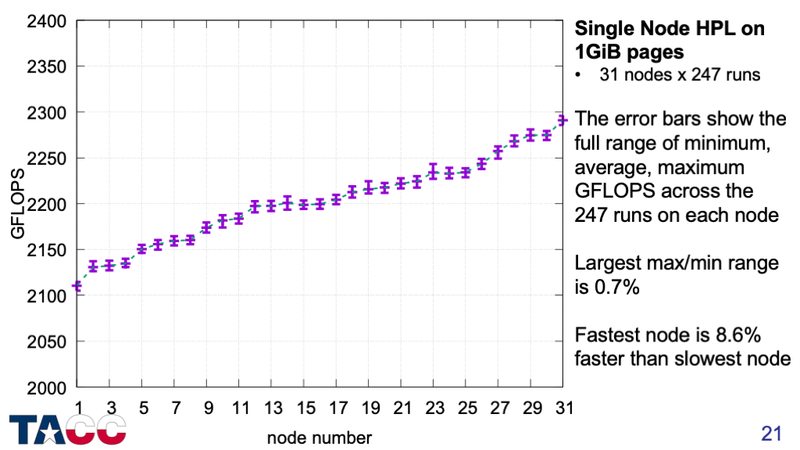 The 8.6% range of average performance for this set of 31 nodes increases to >12% when considering the full 1736-node SKX partition of the Stampede2 system. 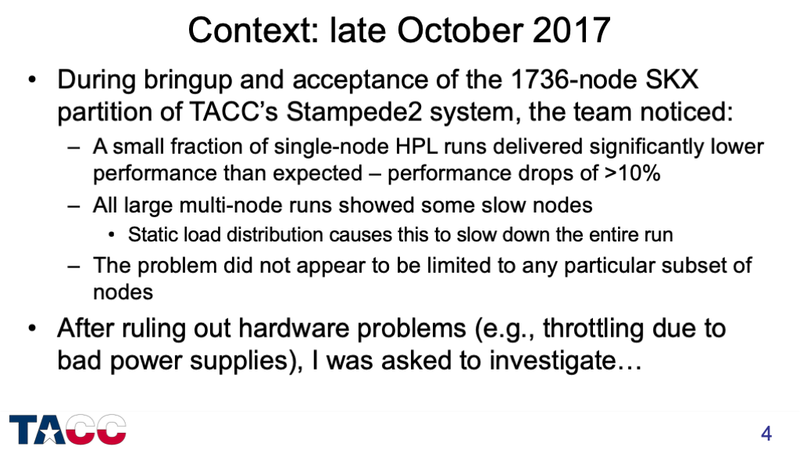 So we have a fix for single-node HPL, what about the full system? 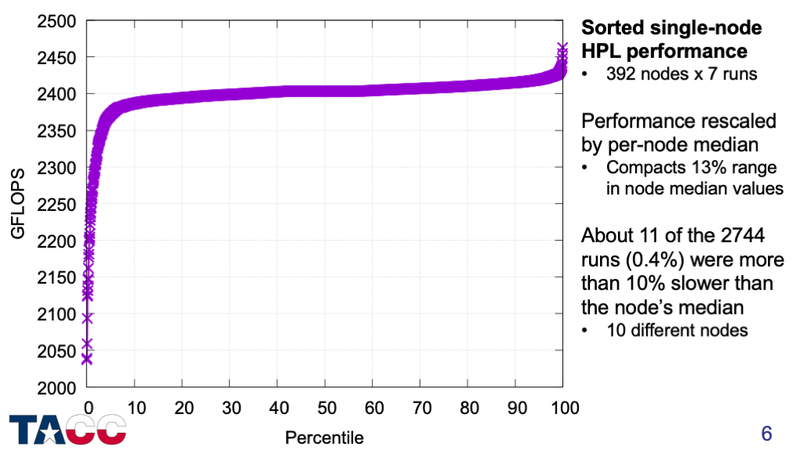 Intel provided a full version of their optimized HPL benchmark in March 2018 and we ran it on the full system in April 2018. The estimated breakdown of performance improvement into individual contributions is a ballpark estimate — it would be a huge project to measure the details at this scale. The “practical peak performance” of this system is 8.77 PFLOPS on the KNLs plus 3.73 PFLOPS on the SKX nodes, for 12.5 PFLOPS “practical peak”. 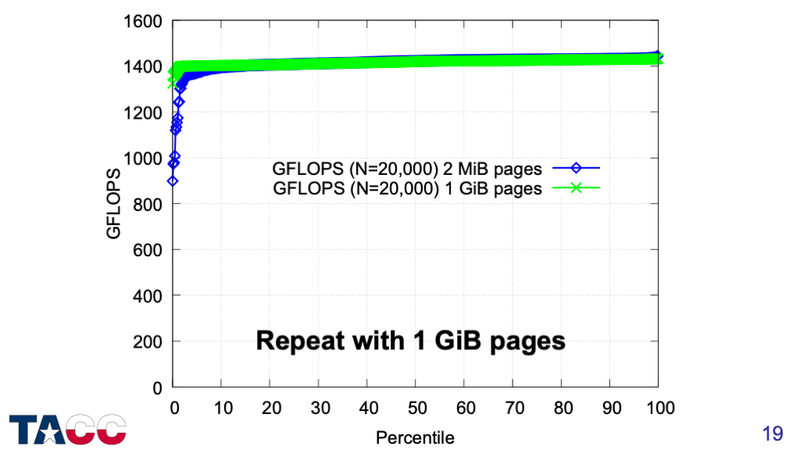 The 10.68 PFLOPS obtained is about 85% of this peak performance. During the review of the paper, I was able to simplify the test further to allow quick testing on other systems (and larger ensembles). This is mostly new material (not in the paper). This lets me more directly address my hypothesis about conflicts with contiguous physical addresses, since each 1GiB page is much larger than the 24 MiB of aggregate L2 cache. It turns out I was wrong — Snoop Filter Conflicts can occur with contiguous physical addresses on this processor. The pattern repeats every 256 MiB. If the re-used space is in the 1st 32 MiB of any 1GiB page, there will be no Snoop Filter Conflicts. I tested Skylake Xeon processors with 14, 16, 18, 20, 22, 24, 26, 28 cores, and a 68-core KNL (Xeon Phi 7250). 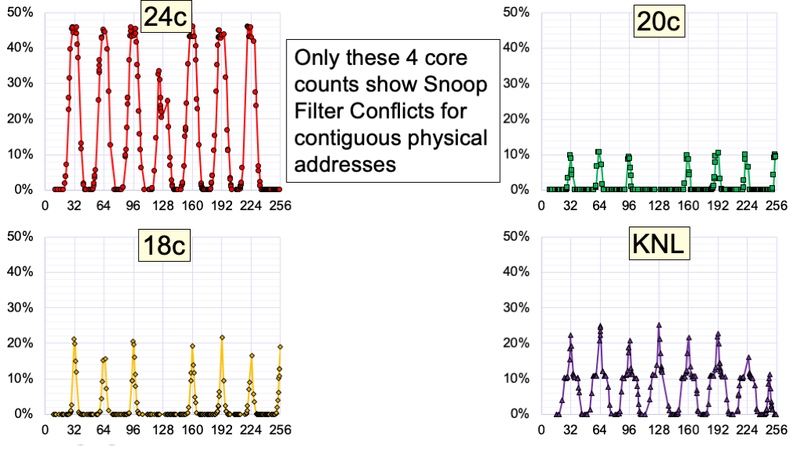 These four processors are the only ones that show Snoop Filter Conflicts with contiguous physical addresses. But with random 2MiB pages, all processors with more than 16 cores show Snoop Filter conflicts for some combinations of addresses….. These are average L2 miss rates — individual cores can have significantly higher miss rates (and the maximum miss rate may be the controlling factor in performance for multi-threaded codes). The details are interesting, but no time in the current presentation…. 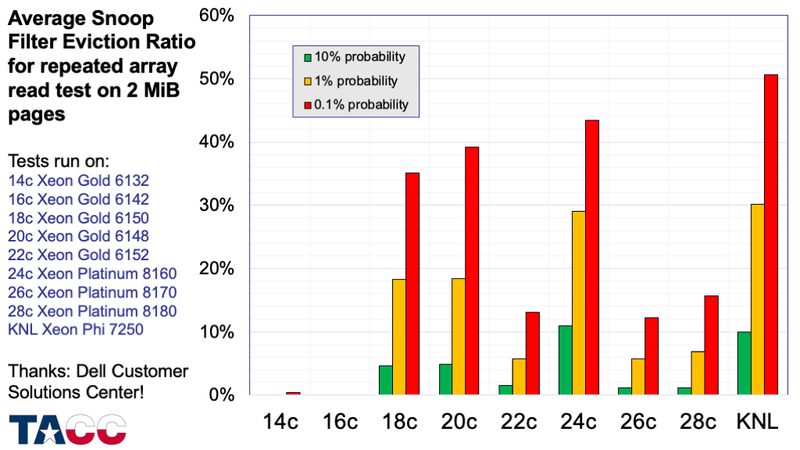 Overall, the uncertainty associated with this performance variability is probably more important than the performance loss. Using performance counter measurements to look for codes that are subject to this issue is a serious “needle in haystack” problem — it is probably easier to choose codes that might have the properties above and test them explicitly. Cache-contained shallow water model, cache-contained FFTs. 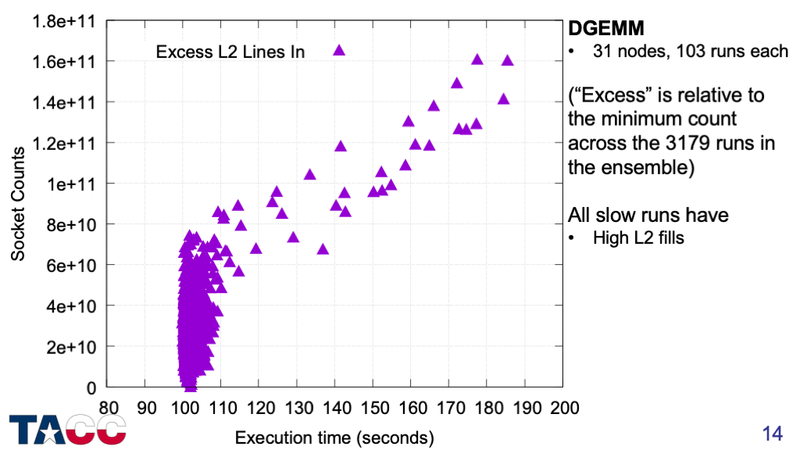 The new DGEMM implementation uses dynamic scheduling of the block updates to decouple the memory access patterns. There is no guarantee that this will alleviate the Snoop Filter Conflict problem, but in this case it does. 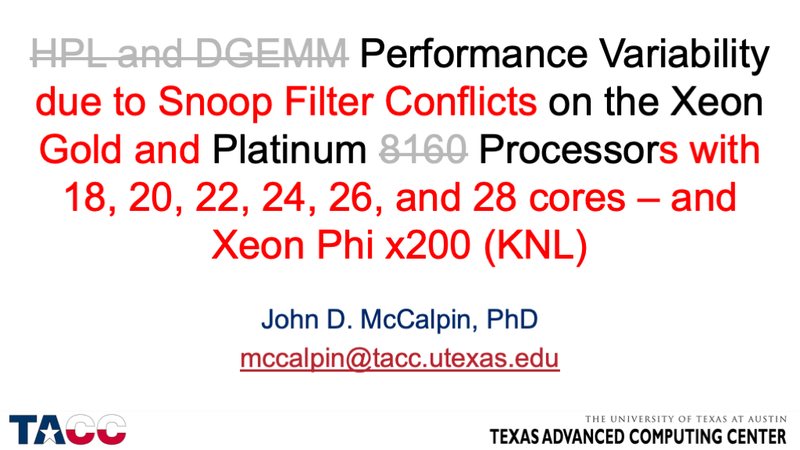 I now have a model that predicts all Snoop Filter Conflicts involving 2MiB pages on the 24-core SKX processors. Unfortunately, the zonesort approach won’t work under Linux because pages are allocated on a “first-come, first-served” basis, so the fine control required is not possible. An OS with support for page coloring (such as BSD) could me modified to provide this mitigation. Again, the inability of Linux to use the virtual address as a criterion for selecting the physical page to use will prevent any sorting-based approach from working. Intel has prepared a response. If you are interested, you should ask your Intel representative for a copy. Most Intel microprocessors support “HyperThreading” (Intel’s trademark for their implementation of “simultaneous multithreading”) — which allows the hardware to support (typically) two “Logical Processors” for each physical core. Processes running on the two Logical Processors share most of the processor resources (particularly caches and execution units). 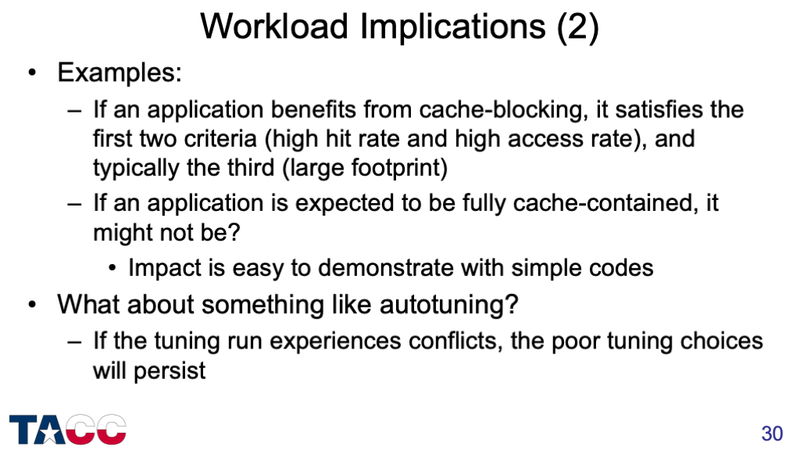 Some workloads (particularly heterogeneous ones) benefit from assigning processes to all logical processors, while other workloads (particularly homogeneous workloads, or cache-capacity-sensitive workloads) provide the best performance when running only one process on each physical core (i.e., leaving half of the Logical Processors idle). It was not immediately obvious how to obtain this split from the available performance counters. 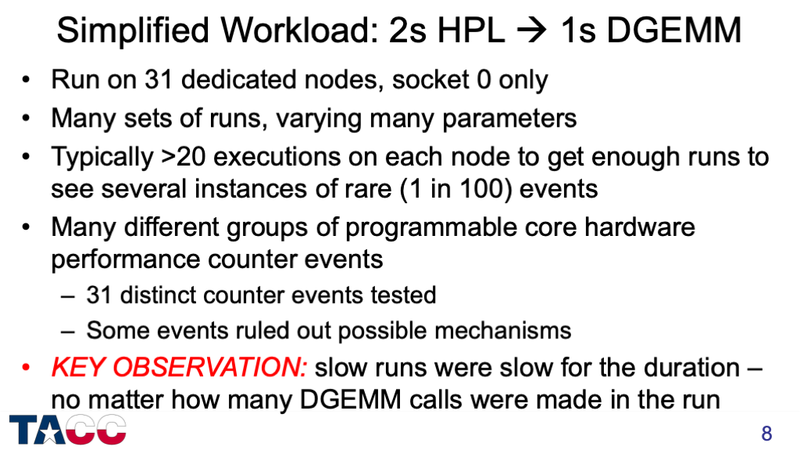 A few of the “events” are common across all processors, but most are model-specific. The fixed-function “Reference Cycles Not Halted” counter increments at the same rate as the TSC, but only while the Logical Processor is not halted. So for any interval, I can divide the change in Reference Cycles Not Halted by the change in the TSC to get the “utilization” — the fraction of the time that the Logical Processor was Not Halted. This value can be computed independently for each Logical Processor, but more information is needed to assign cycles to the four categories. There are some special cases where partial information is available — for example, if the “utilization” is close to 1.0 for both Logical Processors for an interval, then the processor must have had “Both Logical Processors Active” (category 4) for most of that interval. On the other hand, if the utilization on each Logical Processor was close to 0.5 for an interval, the two logical processors could have been active at the same time for 1/2 of the cycles (50% idle + 50% both active), or the two logical processors could have been active at separate times (50% logical processor 0 only + 50% logical processor 1 only), or somewhere in between. Both the fixed-function counters and the programmable counters have a configuration bit called “AnyThread” that, when set, causes the counter to increment if the corresponding event occurs on any logical processor of the core. This is definitely going to be helpful, but the both the algebra and the specific programming of the counters have some subtleties…. The first subtlety is related to some confusing changes in the clocks of various processors and how the performance counter values are scaled. The TSC increments at a fixed rate. For most Intel processors this rate is the same as the “nominal” processor frequency. Starting with Skylake (client) processors, the story is complicated and I won’t go into it here. It is not clear exactly how often (or how much) the TSC is incremented, since the hardware instruction to read the TSC (RDTSC) requires between ~20 and ~40 cycles to execute, depending on the processor frequency and processor generation. The Fixed-Function “Unhalted Reference Cycles” counts at the same rate as the TSC, but only when the processor is not halted. Unlike the TSC, the Fixed-Function “Unhalted Reference Cycles” counter increments by a fixed amount at each increment of a slower clock. For Nehalem and Westmere processors, the slower clock was a 133 MHz reference clock. For Sandy Bridge through Broadwell processors, the “slower clock” was the 100 MHz reference clock referred to as the “XCLK”. This clock was also used in the definition of the processor frequencies. For example, the Xeon E5-2680 processor had a nominal frequency of 2.7 GHz, so the TSC would increment (more-or-less continuously) at 2.7 GHz, while the Fixed-Function “Unhalted Reference Cycles” counter would increment by 27 once every 10 ns (i.e., once every tick of the 100 MHz XCLK). For Skylake and newer processors, the processor frequencies are still defined in reference to a 100 MHz reference clock, but the Fixed-Function “Unhalted Reference Cycles” counter is incremented less frequently. For the Xeon Platinum 8160 (nominally 2.1 GHz), the 25 MHz “core crystal clock” is used, so the counter increments by 84 once every 40 ns, rather than by 21 once every 10 ns. Nehalem & Westmere: “CPU_CLK_UNHALTED.REF_P” increments at the same rate as the TSC when the processor is not halted. Sandy Bridge through Broadwell: “CPU_CLK_THREAD_UNHALTED.REF_XCLK” increments at the rate of the 100 MHz XCLK (not scaled!) when the processor is not halted. Results must be scaled by the base CPU ratio. Skylake and newer: “CPU_CLK_UNHALTED.REF_XCLK” increments at the rate of the “core crystal clock” (25 MHz on Xeon Scalable processors) when the processor is not halted. Note that the name still includes “XCLK”, but the definition has changed! Results must be scaled by 4 times the base CPU ratio. Once the scaling for the programmable performance counter event is handled correctly, we get to move on to the algebra of converting the measurements from what is available to what I want. So each Logical Processor makes two measurements, but they are asymmetric. Starting with the Skylake core, there is an additional sub-event of the programmable CPU_CLK_UNHALTED event that increments only when the current Logical Processor is active and the sibling Logical Processor is inactive. This can certainly be used to obtain the same results, but it does not appear to save any effort. My approach uses only one programmable counter on one of the two Logical Processors — a number that cannot be reduced by using an alternate programmable counter. Comparison of the two approaches shows that the results are the same, so in the interest of backward compatibility, I continue to use my original approach. Updates on 2019-01-23 in blue. The RDTSC instruction increments at the rate of the “base” (or “nominal”) processor frequency, while instructions are executed at the “core frequency”. The “core frequency” may be higher or lower than the “base” frequency, and it may change during your measurement interval. If you have the ability to “pin” the processor frequency to match the “base” frequency, interpreting the results is often easier. 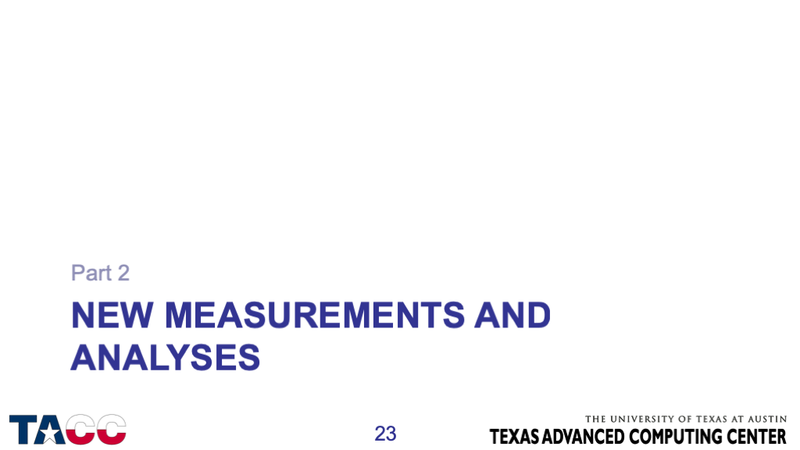 Whether you can fix the frequency or not, you will still need to measure several different things to be sure that you can unambiguously interpret the results. More on this below. With Turbo mode enabled, Intel processors will change their frequency based on how many cores are active. When running a single user thread, you will often get the advertised single-core Turbo frequency, but if the operating system enables more cores to handle (even very short-lived) background processes, your frequency may drop unexpectedly. Recent Intel processors often throttle down to a low frequency when not in use, and (depending on processor generation, BIOS settings, and OS settings) it may take longer than expected for the frequency to ramp back up to the expected values. I usually precede the code that I want to test with a “warm-up” loop consisting of at least a few seconds of execution of instructions using the same SIMD width as the code that I want to test. Always pin the thread you want to test to a single logical processor (if possible). 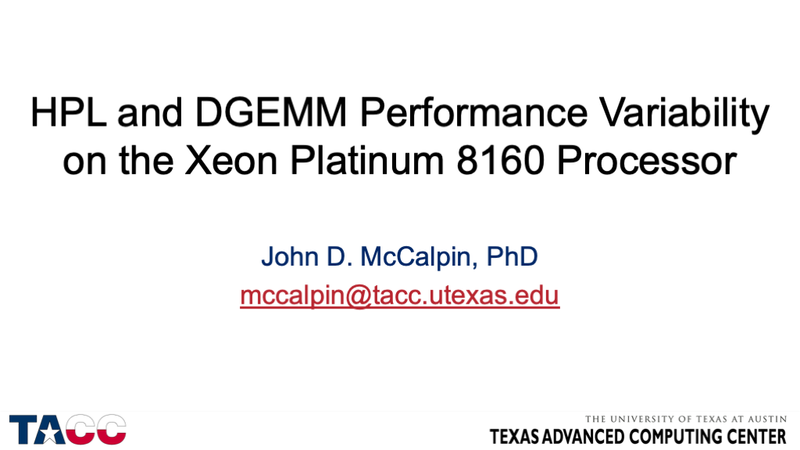 This allows you to use the RDPMC instruction to read the logical processor’s fixed-function performance counters. It also reduces the chance of frequency changes or other stalls that may be incurred when moving a thread context to a different core. Intel processors will be halted during frequency changes, and recent Intel processors (Haswell and newer) will also be halted when activating and/or deactivating the portions of the pipeline(s) needed for 256-bit SIMD instructions and for 512-bit SIMD instructions. The duration of these halts varies by product and in some cases by the amount of the frequency change. I have seen values as low as 6 microseconds and as high as 50 microseconds for these types of transitions. The RDTSC instruction is not ordered with respect to the execution of other instructions. Intel processors have gained increasing ability to execute instructions out of order over the past decade, allowing the execution of these instructions to be moved further away from where one might expect — in either direction. The RDTSCP instruction is partially ordered — it will not execute until all prior instructions in program order have executed. RDTSCP can still be executed later than expected, but not earlier. 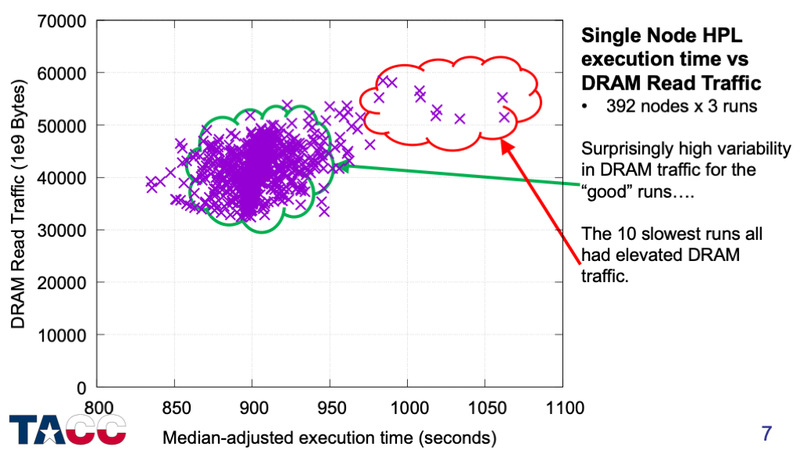 This partial ordering can help expose the execution time of long-latency instructions (such as memory accesses or mispredicted branches) that occur shortly before the final value of the TSC is read using RDTSCP. The LFENCE (“Load Fence”) instruction was originally intended to order memory load operations, but was later extended (architecturally) to order instruction execution. The LFENCE instruction will not execute until all prior instructions have “completed locally”, and no later instructions will begin execution (even speculatively) until the LFENCE instruction completes. It may not be safe to assume that “completed locally” and “retired” are equivalent. “Completed locally” is definitely not the same as “globally visible” — SFENCE is still required if you need to ensure that stores are globally visible before continuing. LFENCE is a fairly lightweight instruction, though the cost depends on the nature of the surrounding instructions. The repeat rate for consecutive LFENCE instructions is 4 cycles for mainstream Intel processors starting with Sandy Bridge (through at least Skylake). The combination “LFENCE; RDTSC” has a slightly stronger ordering than RDTSCP. RDTSCP waits until prior instructions have completed, but does not prevent later instructions from beginning execution before the RDTSCP instruction executes. If you want a lower bound on the execution time between “start” and “stop” instructions, the minimum requirement would be to add “RDTSC; LFENCE” before the “start” instruction and to add “RDTSCP” after the “stop” instruction. 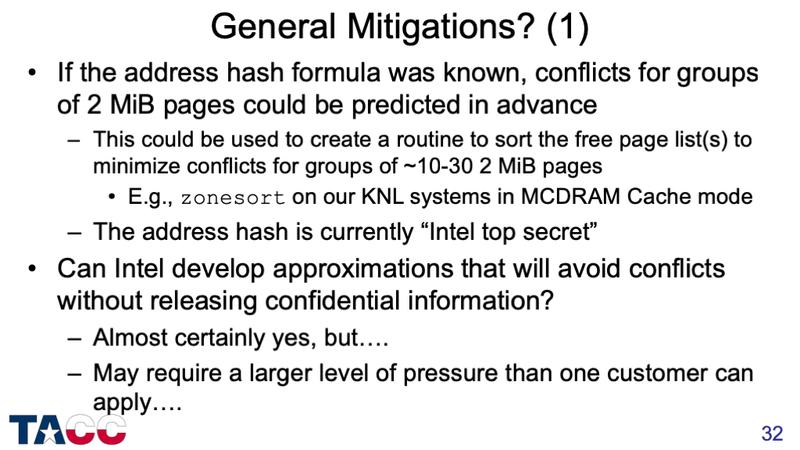 The Intel branch predictors are stranger than you might expect, and branch misprediction overheads are not trivial. If you repeatedly execute an inner loop with a trip count of less than about 30, the branch predictor will “remember” which iteration is the final iteration of the loop, and it will correctly predict the loop exit. If you increase the inner loop trip count to 35 or more, the branch predictor will not “remember” which iteration is the final iteration, so the final loop iteration will include a mispredicted branch, with an associated overhead of 15-20 cycles. This can be very hard to understand if you are looking at results for loop trip counts from (for example) 16 to 64 and you see an unexpected bump of 15-20 cycles once the trip count exceeds a limit (typically in the 32-34 range). This is even more confusing when you consider vectorization and loop unrolling, which the compiler may change significantly from one compilation to the next as you fiddle with your code. Instructions executed in kernel mode. Core cycles not halted in kernel mode. If this is not very close to 1.000, the processor has been halted for frequency and/or pipeline activation issues, and you need to try to figure out why. This should be compared to the expected frequency for your processor, given the number of cores that you think should be active. This will tell you how much of your expected frequency has been lost due to processor halts. For simple loops, you can look at the assembly code and count instructions. This value will change significantly (and repeatably) if the compiler changes the vectorization of the loop. This will change randomly (upward) if the OS schedules another process on the same logical processor during your measured section. For measurements of 10,000 instructions or less, this will increase by a noticeable amount if an OS timer interrupt occurs during your measured section. Should be zero for short intervals (<1 millisecond) that don’t include a kernel timer interrupt. Discard tests with non-zero values for these short cases. Should be very small (<<1%) for any test that does not include an explicit call to a system routine. and deriving a methodology to measure such stalls is even more difficult. 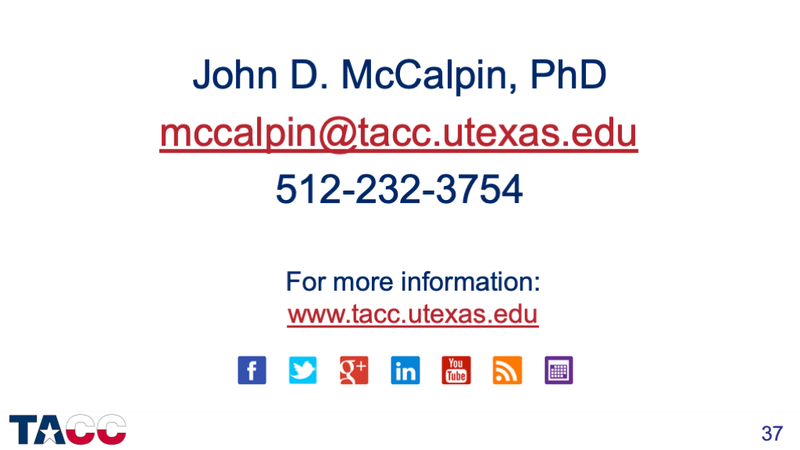 the Stampede system at TACC. Consistently delivers values about 1% to 3% lower than the UOPS_ISSUED.STALL_CYCLES event in my tests. Two events count cycles in which no uops are dispatched from the RS to any of the execution units (aka “ports”). I got the CMASK value from VTUNE — the documentation in Vol 3 of the SW Developer’s Guide is not very helpful. HyperThreading enabled, and I don’t have any systems configured that way to test right now. These two events differed by no more than a part per million in my tests. As discussed in the Intel forum thread (link), the first two events can easily overcount stalls in codes that have a “stall-free” IPC of less than 4. For example, a code with a “stall-free” IPC of 1 could show 75% stall cycles using these events, with uops transferred from the RAT to the RS in one block of 4 uops every 4 cycles (leaving 3 cycles idle). Unfortunately, there is no way to count these execution retries directly, and no way to determine how many cycles had instructions dispatched that were all rejected and retried. Note that one can also count cycles in which no instructions are retired. This was also discussed in the forum thread above, and has the same theoretical problem as counting at issue — the processor can retire at least four instructions per cycle, so if the non-stalled IPC is less than four, burstiness of instruction retirement can result in non-zero stall cycle counts even if there are some instructions executing every cycle. In experiments with the STREAM benchmark, where the actual number of stall cycles should be around 90%, the values produced by CYCLE_ACTIVITY.STALL_CYCLES_L2_PENDING varied between 30% and 93% of the CYCLE_ACTIVITY.CYCLES_NO_DISPATCH counts (without the L2_PENDING qualifier). The lower values were seen with tests using streaming (nontemporal) stores, while the higher values were seen using ordinary (allocating) stores. This pattern makes it clear that this event counts store misses (RFO’s) in the “L2_PENDING” category, but it leaves a “hole” in the memory stall cycle identification in the case where the memory stalls are due to streaming stores. For AVX codes there is an event that catches this reasonably well: Event 0xA2, Umask 0x08: RESOURCE_STALLS.SB (cycles with no issue from the RAT to the RS because the store buffers are full) shows 70%-91% of the total cycles have issue stalls due to full store buffers. So looking at the max of CYCLE_ACTIVITY.STALL_CYCLES_L2_PENDING and RESOURCE_STALLS.SB gives a good indication of stalls due to memory for codes with either allocating stores or streaming stores. Summary: There are resources available to help identify memory-related stall cycles, but they are not as precise as one might like. In most cases these counters can identify when memory stalls are dominating execution time, and this is really what a performance analyst is looking for. Once the problem is identified, tuning work is primarily based on execution time of the code section of interest, with hardware performance counters playing (at most) an advisory role. In response to a question on the PAPI mailing list, I scribbled some notes to try to help users understand the complexity of hardware performance counters for cache accesses and cache misses, and thought they might be helpful here…. For any interpretation of specific hardware performance counter events, it is absolutely essential to precisely specify the processor that you are using. Although it may not make a lot of sense, the meanings of “cache miss” and “cache access” are almost always quite different across different vendors’ CPUs, and can be quite different for different CPUs from the same vendor. 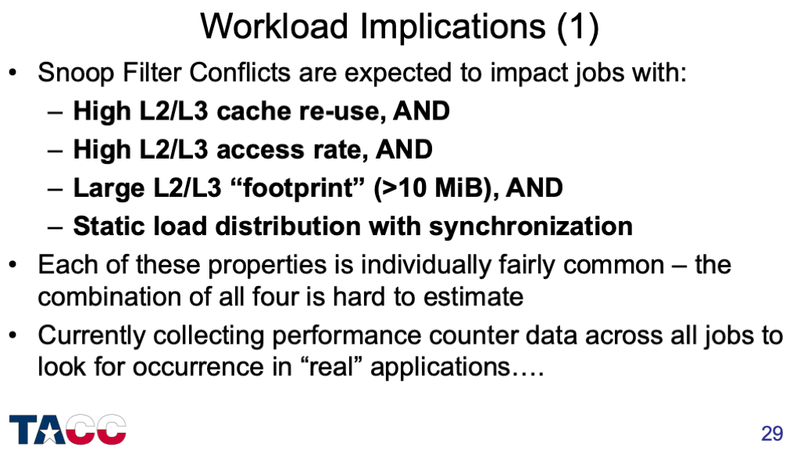 It is actually rather *uncommon* for L1 cache misses to match L2 cache accesses, for a variety of reasons that are difficult to summarize concisely. If an instruction fetch misses in the L1 Icache, the fetch may be retried several times before the instructions have been returned to the L1 Icache. The L1 Icache miss event might be incremented every time the fetch is attempted, while the L2 cache access counter may only be incremented on the initial fetch. L1 caches (both data and instruction) typically have hardware prefetch engines. The L1 Icache miss counter may only be incremented when the instruction fetcher requests data that is not found in the L1 Icache, while the L2 cache access counter may be incremented every time the L2 receives either an L1 Icache miss or an L1 Icache prefetch. The processor may attempt multiple instruction fetches of different addresses in the same cache line. The L1 Icache miss event might be incremented on each of these fetch attempts, while the L2 cache access counter might only be incremented once for the cache line request. The L1 instruction cache miss counter might be incremented only once when an instruction fetch misses in the L1 Icache, while the L2 cache might be accessed repeatedly until the data actually arrives in the L2. This is especially common in the case of L2 cache misses — the L1 Icache miss might request data from the L2 dozens of times before it finally arrives from memory. Identify the processor in detail. This includes vendor, family, model, and stepping. Determine the precise mapping of PAPI events to underlying hardware events. Look up the detailed descriptions of the hardware events in the vendor processor documentation. For AMD, this is the relevant “BIOS and Kernel Developers Guide” for the processor family. 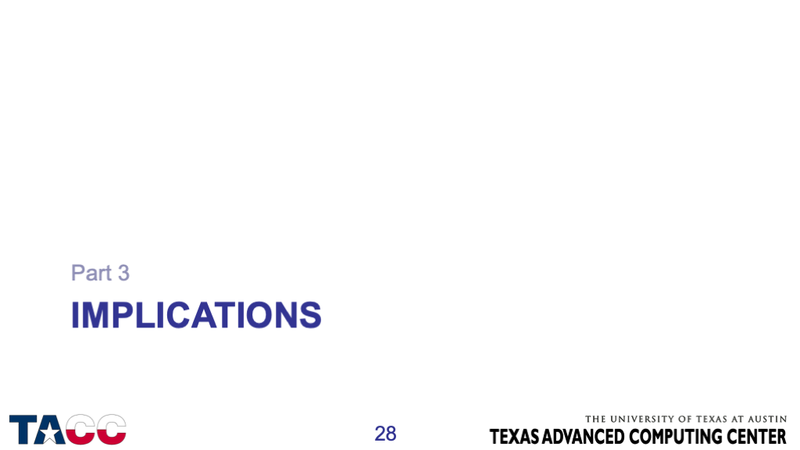 For Intel, this Volume 3 of the “Intel 64 and IA-32 Architecture Software Developer’s Guide”. Check the vendor’s published processor errata to see if there are known bugs associated with the counter events in question. 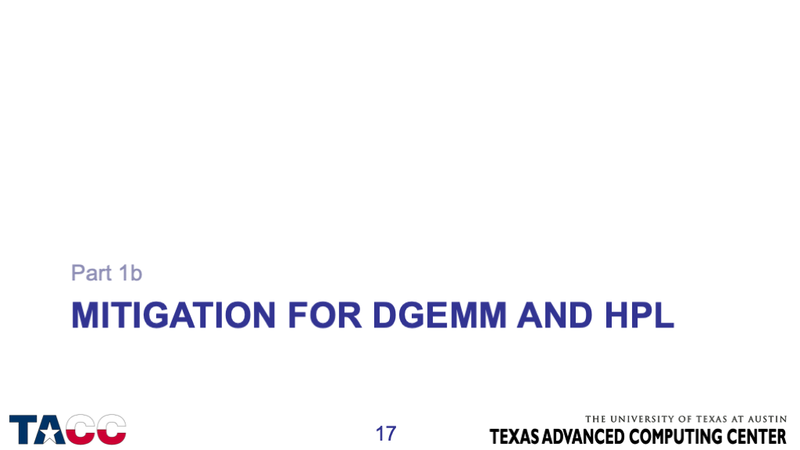 For AMD these documents are titled “Revision Guide for the AMD Family [nn] Processors”. For Intel these documents are usually given a title including the words “Specification Update”. Using knowledge of the cache sizes and associativities, build a simple test code whose behavior should be predictable by simple paper-and-pencil analysis. The STREAM Benchmark is an example of a code whose data access patterns and floating point operation counts are easy to determine and easy to modify. Compare the observed performance counter results for the simple test case with the expected results and try to work out a model that bridges between the two. The examples of different ways to count given at the beginning of this note should be very helpful in attempting to construct a model. Decide which counters are “close enough” to be helpful, and which counters cannot be reliably mapped to performance characteristics of interest. As an example of the final case — counters that cannot be reliably mapped to performance characteristics of interest — consider the floating point instruction counters on the Intel “Sandy Bridge” processor series. These counters are incremented on instruction *issue*, not on instruction *execution* or instruction *retirement*. If the inputs to the instruction are not “ready” when the instruction is *issued*, the instruction issue will be rejected and the instruction will be re-issued later, and may be re-issued many times before it is finally able to execute. The most common cause for input arguments to not be “ready” is that they are coming from memory and have not arrived in processor registers yet (either explicit load instructions putting data in registers or implicit register loads via memory arguments to the floating-point arithmetic instruction itself). There are likely other applicable factors as well — for example the Intel “Sandy Bridge” processors support several mechanisms that allow the power management unit to bias behavior related to the trade-off of performance vs power consumption. One mechanism is referred to as the “performance and energy bias hint”, and is described as as a “hint to guide the hardware heuristic of power management features to favor increasing dynamic performance or conserve energy consumption” (Intel 64 and IA-32 Architectures Software Developer’s Manual: Volume 3, Section 14.3.4, Document 325384-047US, June 2013). Another mechanism (apparently only applicable to “Sandy Bridge” systems with integrated graphics units) is a pair of “policy” registers (MSR_PP0_POLICY and MSR_PP1_POLICY) that define the relative priority of the processor cores and the graphics unit in dividing up the chip’s power budget. The specific mechanisms by which these features work, and the detailed algorithms used to control those mechanisms, are not publicly disclosed — but it seems likely that at least some of the mechanisms involved may impact the floating-point instruction retry rate.